Thanks to Dr. Pallavi Rao, Sakra World Hospital, Bangalore (India) for contributing this case and Dr. Raul S. Gonzalez, University of Rochester Medical Center, Rochester, NY (USA) for writing the discussion. To contribute a Case of the Week, first make sure that we are currently accepting cases, then follow the guidelines on our main Case of the Week page. 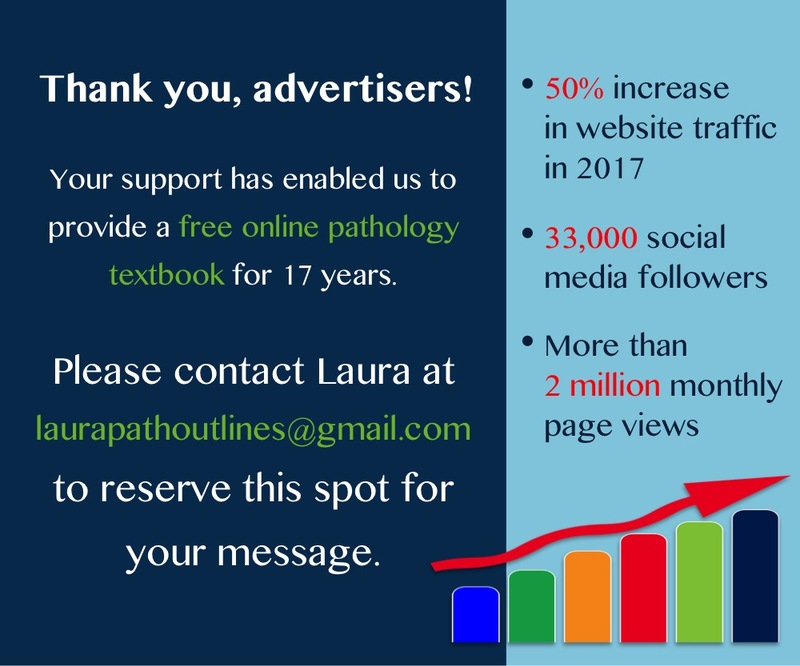 (1) Dr. Pernick published a Letter to the Editor about how Complexity Theory suggests that tumors with no known intermediate state may, in fact, have preinvasive neoplasia identifiable by molecular patterns, see Archives of Pathology & Laboratory Medicine: May 2018, Vol. 142, No. 5, pp. 558-558. Click here for his CV with related publications. (2) Our Jobs page now lists advertised Jobs by organization, as well as by date posted, location, subspecialty and regional totals by subspecialty. It helps organizations / institutions keep track of all of their jobs. This option is available for institutions that purchase a promotional package of 6 or more job ads. Contact JoyPathOut@gmail.com for more information. (3) We also list advertised conferences by organization, as well as by location, month and subspecialty on our Conference page, to make it easy for you to find the right one to attend. If you do not see a certain conference listed, please email us at commentspathout@gmail.com and we will contact them. Follow or visit our Blog to see recent updates to the website. 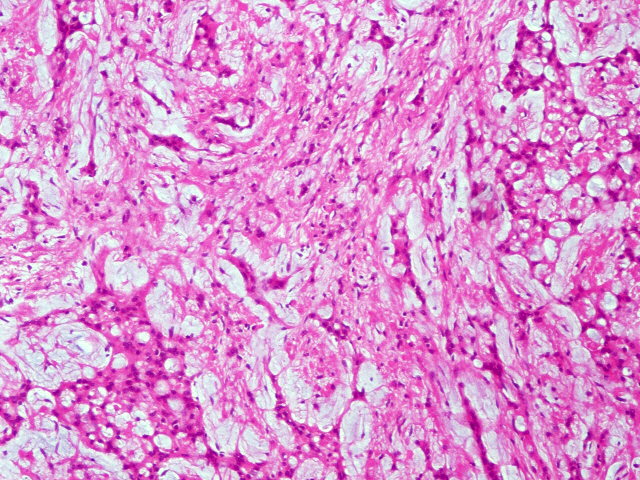 A 37 year old man had an 11 cm gastric mass on the serosal surface which was incidentally detected and clinically suspicious for a gastrointestinal stromal tumor (GIST). A proximal gastrectomy was performed. 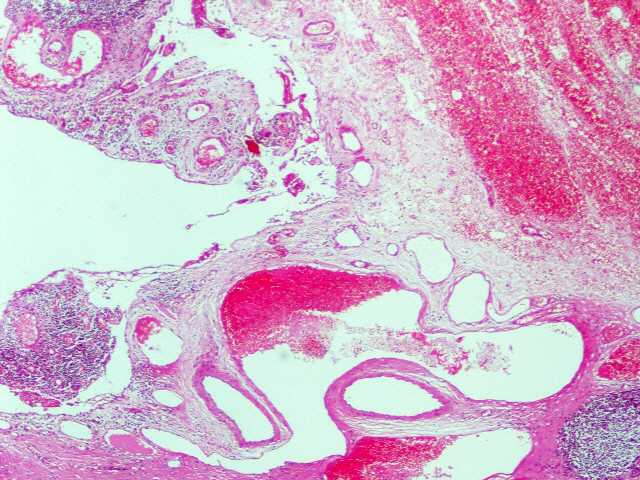 Which of the following describes the majority of schwannomas arising in the gastrointestinal tract? 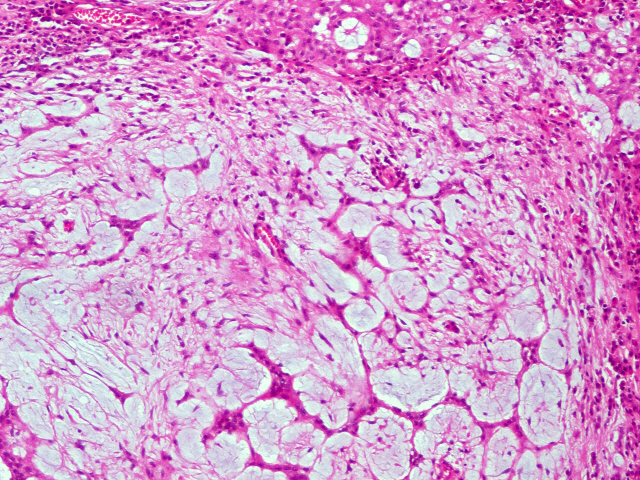 Microcystic / reticular schwannoma is a rare variant of schwannoma that can arise at multiple sites throughout the body, though roughly half occur in the gastrointestinal tract (Am J Surg Pathol 2008;32:1080, Ann Diagn Pathol 2011;15:198). 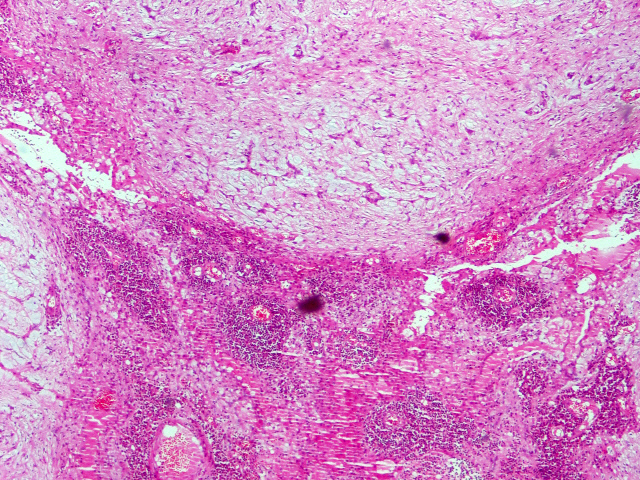 The most common location for schwannomas in the gastrointestinal tract is the stomach, as in this case (Hum Pathol 2012;43:650). Patient age and tumor size are highly variable and there is no known link with any genetic syndromes. 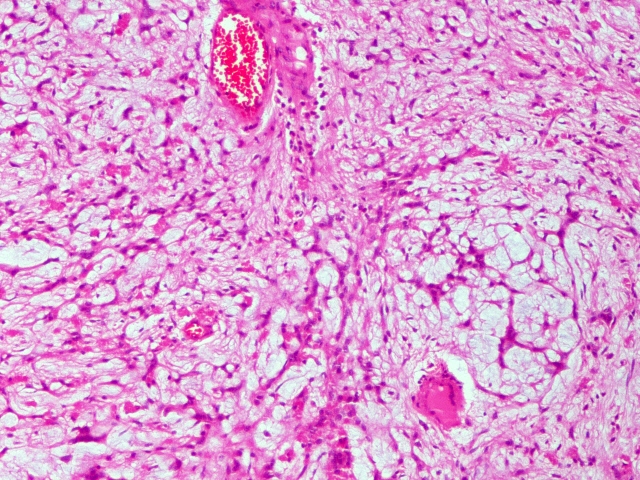 These lesions tend to be circumscribed and only subcutaneous cases are encapsulated. 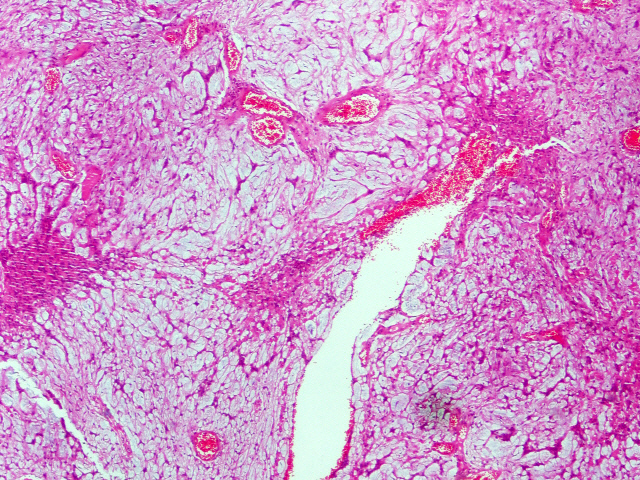 The lesional cells take on a microcystic / reticular growth pattern, forming cords and strands that intersect and anastomose. 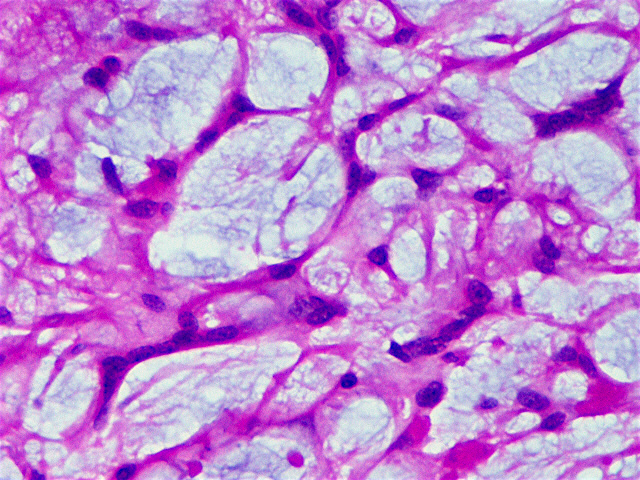 The cells themselves are spindled with eosinophilic cytoplasm and round or tapered nuclei with subtle nucleoli. 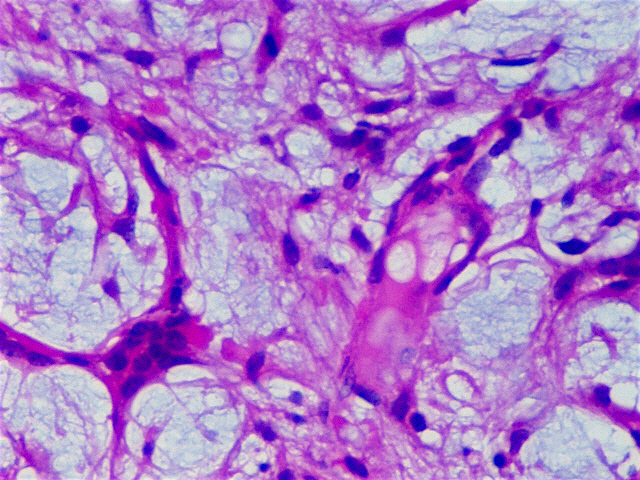 The background stroma is variably myxoid, hyalinized and collagenous. Mitotic figures are uncommon. 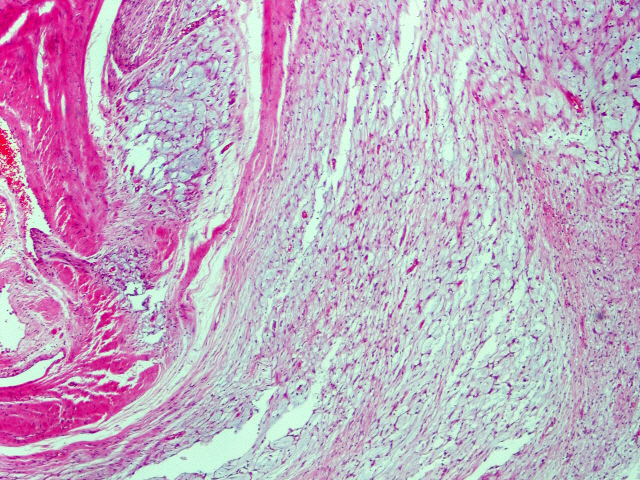 A minority of cases will show a component more closely resembling a traditional schwannoma. 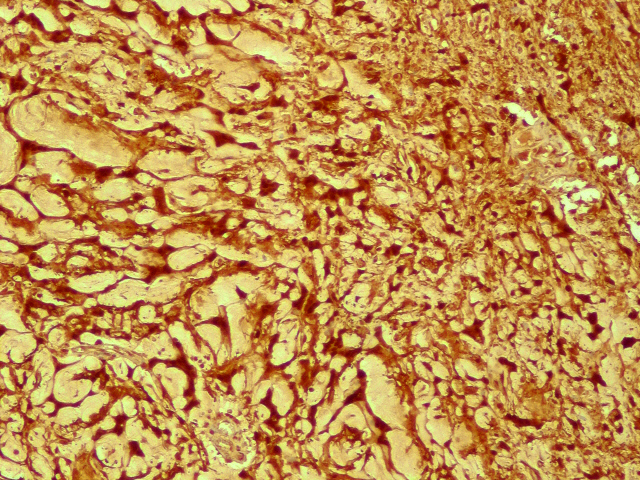 As with other schwannomas, immunohistochemistry for S100 is positive. Other key markers of differentiation, including cytokeratin and smooth muscle actin are negative. 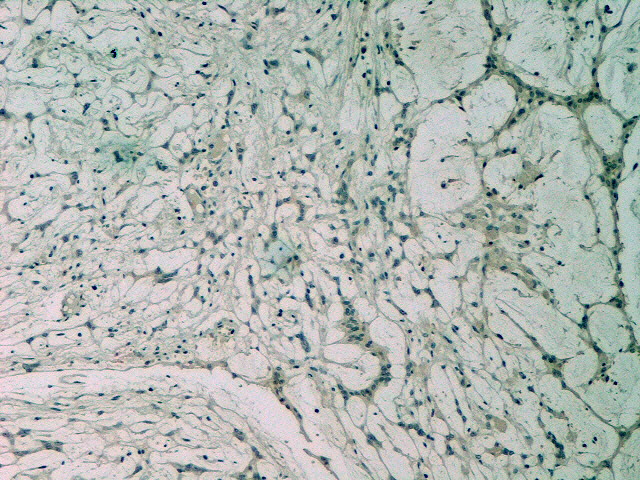 CD117 staining may be focally present but is usually absent. 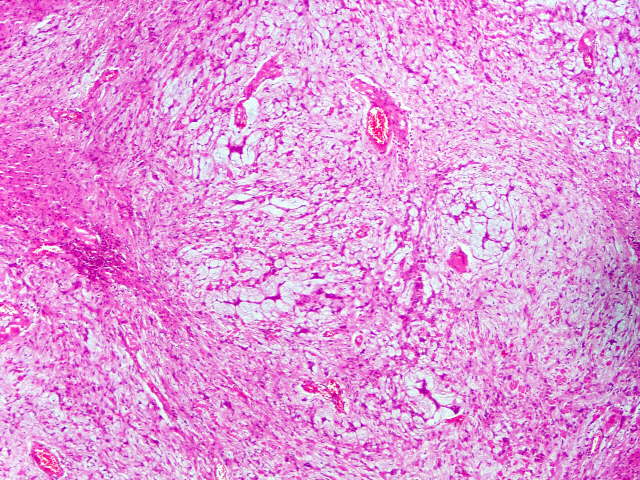 Microcystic / reticular schwannoma is a benign lesion that does not appear to recur or cause patient mortality. 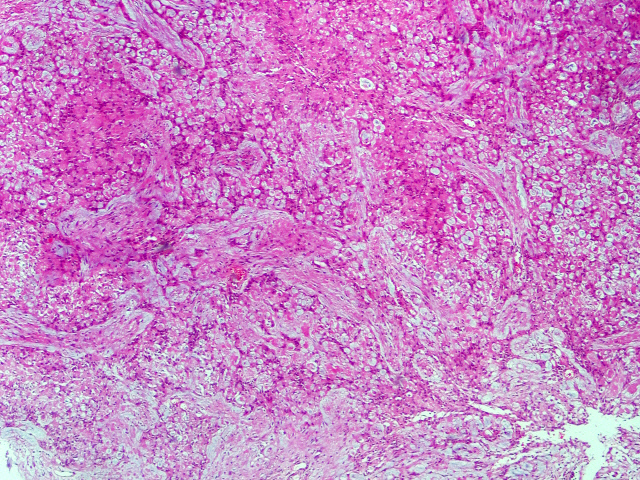 The differential diagnosis for bland mesenchymal lesions in the gastrointestinal tract includes gastrointestinal stromal tumor (positive for CD117 and DOG1), leiomyoma (positive for smooth muscle actin) and desmoid fibromatosis (nuclear positivity for beta-catenin). The differential diagnosis is greatly expanded if the lesion arises in soft tissue or skin (J Cutan Pathol 2016;43:93).